Opinions/Advice On This Whetstone Please? I was reading some articles about which whetstone to use for sword sharpening, including on this site, but it didn't really go into much detail about the grit, so I found this one (recommended by one of them) which seems to have great reviews, what do you think? That one has 1,000/6,000 grit. I'm completely new to sharpening and if I do try it, it will be on a cheap "kopis" machete to practice (although I am absolutely not trying to ruin it). Also the SBG article said I also needed a metal file (to use before the whetstone), are there specific types of files I need or are metal files mostly the same, I'm totally new to this. The part that is amazing to me is that people can actually get such a specific angle, like 25 or 30 degrees freehand without using and sort of guide. 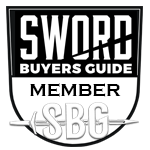 To give you some perspective, most production swords are only polished to a 600-800 final grit finish. If you want to rebuild an edge, I'd suggest starting way lower, like 320 grit or possibly lower. As to the stone, King is a good quality brand. Not the tippiest of tops, but really good for the price. 1000/6000 is a big jump in grits, though. 1000 is good to refresh an angle on an already set edge, not really to rebuild one. 6000 is mostly just polishing and refining. If you were wanting to sharpen an edge from dull then you'd be at it for a looong time starting at 1000. If the edge is already decent and just needs a touch up then it should be fine. Also, it'd take a good long while to get rid of the 1000 scratches with the 6000. To bridge the gap I'd suggest getting some wet/dry sandpaper in as many grits as you can find between 1000 and 6000. I've seen 1000-2500 grit around my local auto shops, but after that they get more difficult to find. I actually usually recommend starting out with sandpaper to being sharpening. Stones are fantastic once you've got a good hand at it, but there is a more severe learning curve with them as compared to the paper. I’d suggest you follow Jordan’s suggestion in regards to sandpaper. In fact I have a whetstone that I rarely use in preference to sandpaper. I say sandpaper but actually it’s wet/dry paper. Use a light oil or water with the paper. I’d start with 220 on a new machete edge. You would benefit from watching the various sharpening techniques on YouTube before purchasing or beginning. Wow, I had no idea sandpaper would be so effective, thanks guys! 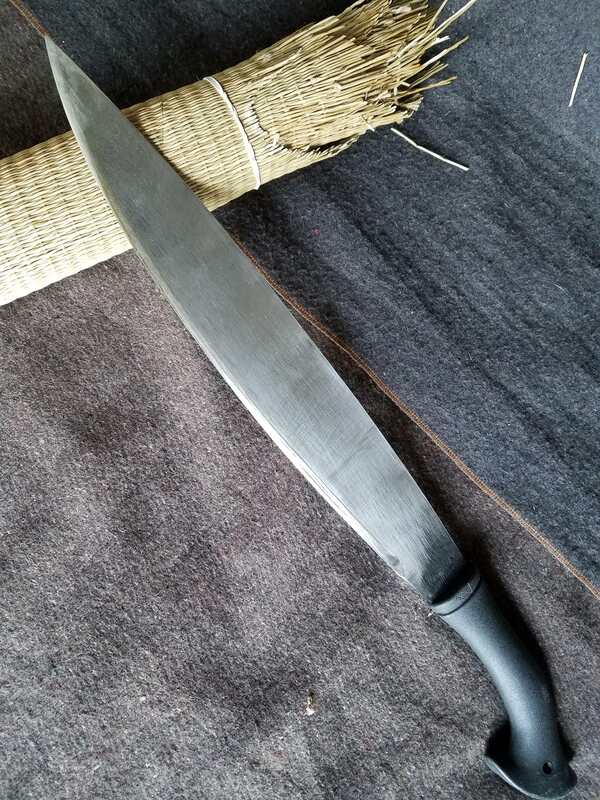 My first "learning experience" will be putting an actual edge on the machete I mentioned, it came with I think a "factory edge", but it seems very dull. I guess you could cut something with it if you really tried (though not well at all) but I'm sure it's not sharp enough. I know not to put too sharp of an edge on "combat" weapons but this one is definitely too dull. I'll look into some sandpaper then, is it really as easy as I think it is? Just put on some hand protection and run the sandpaper across the edge at a 25-30 whatever you want degree angle, just like you would with a metal file, but much more carefully? I have a strong feeling I'd mess up the angle. Here's Tom Kinder of TomKin Forge's old video on how he does it. Before he was a sword maker he was well known for his sword sharpening. That’s a good video, however you might want to view other videos to give yourself a broader base to start building on. A couple of things I’ll throw out to you is the first time on your machete use nothing finer than 220 grit to start. Most people in the beginning will start with too fine of a grit making more work for themselves. As I like convex edges I find a compressible backing on the paper advantageous as it will follow the surface of the blade better than a flat backing, even when rocking the blade. There are several techniques, even when using sandpaper some will work for you better than others, and in one case one technique will work best and in another a modification will be needed. As an example stationary paper or stone and move the blade, and in another just the reverse. Above all PATIENCE. Thanks, great advice, can't wait to try this. The machete actually has that black anti-corrosion finish (Cold Steel), I guess that will automatically be taken away when I sharpen the edge. I already tried with steel wire but the progress was painfully slow so I just left it the way it is. Oil and 120 grit sandpaper will take it off nicely, but be prepared for a bare steel surface. Many people do not like CS finish and go out of their way to remove it. And then I suspect spend additional time fighting rust. Living in the tropics where rust is an ever presenting thing I welcome the anti-rust coating. Here are photos of my two CS Barong Machetes now out of production, Chinese mfg. The 18” model, the least used, still has its coating except on the cutting edge, of course. The 12” model, and by far the most used, shows the finish being worn away by over a decade of use. I’ve had no rust problems even on the naked edges. Excuse the quality of the photos, the LCD view finder stopped working and the replacement camera is still in customs. My experience with sandpaper is with wet/dry emery paper glued to a piece of plywood, with the finer grits available at auto parts stores or (in the US) online. If you are experimenting with different grits, it is a lot cheaper than buying a whole set of stones. Some folks glue it to an old mouse pad. On my belt sander, I have found that belts made for metal removal, which cost about 3 times the general purpose ones, are well worth it. I get them From Red Label Abrasives. I just sharpened a couple new Imacasa machetes 2 days ago. I started with 40 grit flapper disk on my angle grinder. This may seem extreme, but Imacasas come blunt, which is different from "dull". After establishing the bevel, I went to my belt sander with 120 grit, then to Lansky lawn mover blade stone. Any fine stone will do, the Lanskys are just more convenient. That is sufficient for a working machete. I haven't tackled a sword yet. The 2 I have selected for HD came sufficiently sharp for home defense. I will probably touch them up with my Arkansas fine stone, but the factory bevels are good so less is better as far as sharpening. Needless to say, tackle your sword with patience. If the bevel is good be careful to leave it alone and just sharpen and polish to your hearts delight. If the factory bevel is bad, or it comes blunt, you have a much bigger job so study up and get MUCH practice on cheaper things. And don't forget the permanent marker! This is a key tool for sharpening--mark the edge so it is easier to see what you are grinding. Ditto on factory black coatings or paint (usually on hatchets). It is there for a reason, most obvious in humid climates. I leave it alone, just pulling it back 1/2 to 1 inch from the edge for sharpening and polishing. Probably not an issue in dry climates or for daily use knives which you will be cleaning frequently.